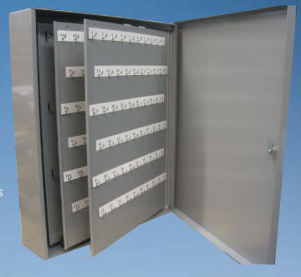 Originally developed for 'old-fashioned' vehicle keys, this premium quality heavy duty wall key storage cabinet has hooks instead of slots to accommodate thicker keys. Each of the key hooks is a full 5/8" in length for hanging either a key tag or placing a key directly on the hook. However, the new electronic key fobs used in newer cars may not fit as nicely. If you need to store these keys, please call us first. The key cabinet is constructed of heavy duty 18 gauge steel welded for strength with a baked-on enamel finish; designed to stand up to regular daily use. Includes key lock and interior hinged panel as shown. Generous 1-1/2" horizontal spacing between hooks. Furnished with numbered key hook labels & clear vinyl label shields (protectors). NOTE: Fixed panels have hooks on both sides except when ordering a 60 hook cabinet when a panel will have hooks on the front only.